More fun fabric by Lori Whitlock for Riley Blake Designs! I was so happy that Lori invited me to play on the Game Day tour as well as last week's Happy Day! I immediately knew what I needed to make for some of my favorite Little Rascals! Spanky, Alfalfa and Buckwheat? No, it's Gage, Keagan and Cache. 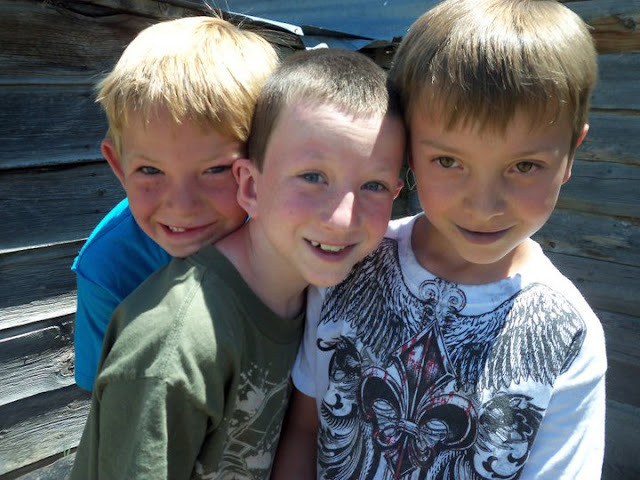 Three of my little nephews at the family farm 5 or 6 years ago. "Whatcha doin'?" "Nuthin'". They were sneaking Grandpa's bat out of the old cellar to go and play a little ball. Little Rascals, indeed. Now they're all on teams playing basketball, baseball, even football! Whatever the sport, this Pack-Along Sports Throw is my favorite quilt for game-watching! These giant blocks go together so fast, it took waaayyy more time to lay it out and decide on the design than it did to make all the blocks! Believe it or not, this quilt uses all the same blocks as my original layout above. This one's a bit out of my comfort zone, but this wacky layout is what the first kid wanted. Plus, Cuddle plush fur on the back for those chilly game nights, of course. Love that minky! It's 60" wide, so that helped to determine the size of the quilt too. For the quilting design, I tried out a little football/basketball combo (bballs & fballs by Kim Diamond). I love it. And even if it's not very cold outside, the quilt can also be used as a picnic quilt or a stadium cushion. See the tutorial and download instructions to turn a quilt into a Pack-Along HERE. I love that Lori's prints come in three different colorways. I can make a different color combo for each of the boys. Big thanks to Lori Whitlock, and the folks at Riley Blake Designs for supplying the fabrics for this project! It's so fun to have selections of some great "boy fabric"!! And, finally, I love those darling not-so-little-any-more nephews of mine. Where does all the time go? 4/25 Deonn @ Quiltscapes Thanks for stopping by! Such a great on-the-go sport quilt! The fabrics are such fun, your design layout is perfect and that quilting is so awesome appropriate. Love the boy's pose...definitely a little rascals guilty pose. They do grow up too quickly. Those cuddle blankets must be a welcomed addition to the chilly games and I love the quilting on it. What a perfect sport quilt!